This project is on Priority Project List 1. Land loss and land gain are terms we throw around a lot at CWPPRA but what do they mean? Where does the old land go and where does the new land come from? To answer that, we need to understand that “land” is made of inorganic particles that we call sediment and various types of organic matter. Sand, clay, gravel, boulders, and silt are all types of sediment, and grain size is how we classify them. For example, a boulder is larger than gravel, which is larger than a grain of sand, which is larger than a silt particle, etc. Sediment size influences how each grain experiences force and inertia, which leads to different rates of land loss and gain between sediments. Imagine holding a handful of sand in one hand and a handful of gravel in the other. Now imagine you blow as hard as you can on each one. More gravel would stay in your hand than sand. The same is true of sediment in water- smaller grains of sand can be picked up more easily by the forces acting on them than the gravel can. Sediments move downstream differently depending on their size class. Wetlands are defined by sediment type and other characteristics including salinity. In Louisiana, we have fresh water wetlands like swamps and bottomland hardwood forests, but also saline wetlands like salt and brackish marsh. Each of these wetlands types contains fine sediment particles, and they are all relatively new in the scope of geologic time. Because they are young, there are not many hard-packed substrates in Louisiana wetlands, but instead deeper layers of sediment that are compacting and subsiding. Sediment replenishment is important to all the wetlands in Louisiana because new sediment is needed on top of compacting sediment to maintain elevations that support plant life and productive ecosystems. Unfortunately, sediments that should be replenishing the wetlands of Louisiana are not doing so. Instead, they are being transported out into the Gulf of Mexico or are trapped farther upstream behind dams. 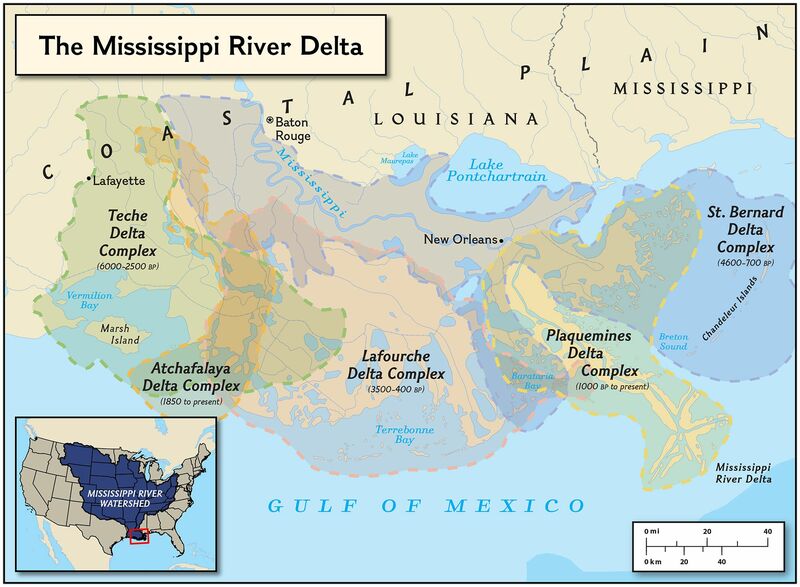 More information about this topic can be found in our post “The Mississippi River Deltaic Cycle”. Controlling the flow of the Mississippi river keeps sediments suspended for longer because water does not disperse or slow down as it naturally wants to. Without new sediment, marsh platforms lose structural integrity and they erode, leaving open water where marsh once was. To answer the original question; for CWPPRA land loss is the process of sediment and marsh sinking or eroding into open water along Louisiana’s coastline and reducing the land available. Land gain describes the process of sediment depositing to form new platforms and it is much less common along our coast, but CWPPRA and their Partners in Restoration are working to restore the integrity of coastal wetlands by moving and capturing sediment, planting stabilizing species on terraces, and creating marsh in critical areas. Combating land loss is a multi-disciplinary effort, and we have a long fight ahead. Water flows downhill naturally and, over time, will make a river change from one path to another. As sediment moved and elevations changed over the last 7 millennia, the Mississippi River has emptied into several historic delta complexes: Maringouin, Teche, St. Bernard, Lafourche, Plaquemines-Balize, and Atchafalaya. Each of the deltas built up part of Louisiana’s coast to what we see today, but now that natural process has been interrupted . After the great Mississippi flood of 1927 that caused $1 billion worth of damages (almost $1 trillion in today’s dollars), the US Army Corps of Engineers built the world’s longest levee system under the Flood Control Act of 1928. The Levee system was constructed to reduce flood damages and allow for more control of the Mississippi . An unforeseen and unfavorable side effect to taming the river was that all the water is kept moving too quickly to deposit sediment, and now sediment is lost to the Gulf of Mexico rather than deposited into our coastal wetlands . Our Louisiana coastline is dependent on new sediment to nourish wetland ecosystems. Without sediment delivery, there is no material for natural land gain or replenishment, which will continue to contribute to our retreating coastline. The solution is not as simple as removing the levee system, however, since so much of Louisiana is populated now, and removing the levees containing the Mississippi would displace millions of residents from their homes. Instead, CWPPRA and our partners in restoration use man-made systems to create marsh, nourish wetlands, and maintain hydrologic connectivity so that we can protect and restore Louisiana’s coast. On November 18th, residents and visitors in St. Bernard Parish were treated to live music, cooking demonstrations, and the chance to sample wild boar recipes prepared by teams vying for bragging rights. Hosted by the Coastal Division of St. Bernard Parish, the first Cook-Off for the Coast was held at Docville Farm in Violet, Louisiana with proceeds benefiting the St. Bernard Wetlands Foundation. In addition to evaluating the food of the six competing teams, visitors watched local celebrity chefs prepare everything from gumbo to snapping turtle and talked with a range of coastal organizations about the importance of protecting southeast Louisiana’s coastal wetlands. Sinead Borchert and Mirka Zapletal from the Coastal Wetlands Planning, Protection, and Restoration Act (CWPPRA) Outreach Office were in attendance with information about restoration projects in St. Bernard Parish, activity books, posters from the #ProtectOurCoast series, and recent issues of WaterMarks magazine. They also invited children and adults alike to match Louisiana wildlife with the correct wetland habitat. St. Bernard’s coast is vulnerable to storms, subsidence, erosion, and invasive species, putting wildlife habitat and coastal communities at risk. CWPPRA projects work to support Louisiana’s coastal wetlands and the people and wildlife that depend on these habitats. as being converted to open water from internal breakup. remaining reaches of the Barataria/Plaquemines shoreline. This project is on Project Priority List (PPL) 19. More than a seafood delicacy, oysters are an incredible natural resource. They are extremely helpful to our environment by filtering water, providing habitat, and controlling erosion. Adult oysters may filter up to two and a half gallons of water per hour, which in turn improves water quality. Oysters build reefs that provide habitat for fish, shrimp, crabs, and other aquatic animals. Oyster larvae need the hard, shell surface for settlement and growth. A special focus that has been put on oysters recently is their ability to control land erosion. Oyster reefs have been constructed along eroding shorelines in an effort to lessen wave energy and ultimately reduce erosion. Seven of our nation’s fifteen largest shipping ports are located along the Gulf of Mexico. The wakes created by the cargo ships heighten erosion along an already disappearing coastline. Globally, it is estimated that 85% of oyster reefs have been lost. Large-scale restoration projects can create man-made oyster reefs that duplicate many of the benefits of natural reefs. Oysters and the massive reefs provide a foundation for a healthy ecosystem. The Coalition to Restore Coastal Louisiana (CRCL) founded the Oyster Shell Recycling Program in 2014. This program collects shells from New Orleans area restaurants and utilizes the shells to restore fading oyster reefs that protect Louisiana’s coastline. A majority of shell removed from the coast is not returned back to the waters. It is vital to Louisiana’s disappearing coastline that oyster shells are brought back to help as a line of defense for coastal restoration. CWPPRA has protected, created, or restored approximately 96,806 acres of wetlands in Louisiana. The Coastal Wetlands Planning, Protection, and Restoration Act has funded coastal restoration projects for 26 years. Presently, CWPPRA has 153 total active projects, 108 completed projects, 17 active construction projects, 23 projects currently in Engineering and Design and has enhanced more than 355,647 acres of wetlands . These projects provide for the long-term conservation of wetlands and dependent fish and wildlife populations. Projects funded by CWPPRA are cost-effective ways of restoring, protecting, and enhancing coastal wetlands. 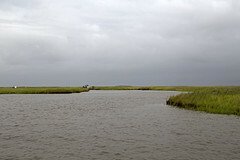 CWPPRA has a proven track record of superior coastal restoration science and monitoring technique in Louisiana. The success of the CWPPRA program has been essential in providing critical ecosystem stabilization along Louisiana’s coast and has provided pioneering solutions for land loss. Visit CWPPRA’s website for more information!